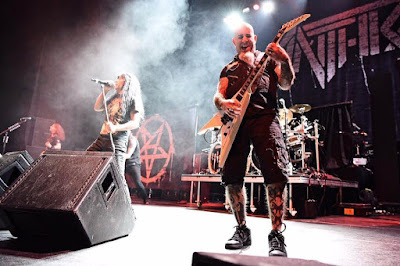 The fan favorite from “Among The Living” is among those featured on the early 2017 tour that saw Anthrax deliver their third album in its entirety alongside a set a classic tracks selected by fans. Due April 27 and directed by Paul M. Green, “Kings Among Scotland” delivers the group’s February 2017 show at Glasgow’s Barrowland Ballroom. Last month, guitarist Scott Ian published his new book, “Access All Areas: Stories From A Hard Rock Life.” The project sees the rocker recount his craziest rock stories as he shares tales of humor, excess, fun, debauchery, food, booze, and mayhem from his many years on the road. Anthrax recently launched a co-headlining tour of North America with Killswitch Engage that will wrap up in early March.